Orange you glad we get to celebrate a warm summer day with a fresh and tasty cocktail? June 27 is National Orange Blossom Day! It’s also National Indian Pudding Day. Considering that we also celebrate chocolate pudding and tapioca pudding this week, I was not happy about what I perceived to be pudding overkill. “Somebody’s pudding me on,” I said. “Whose big idea was it pudding all these similar food holidays together in the same week?” Once my pudding puns were exhausted, I got down to the business of researching Indian pudding, and learned that no box of Jell-O mix would suffice for this rather complicated dessert. Indian pudding is a porridge-like mixture of cornmeal, milk, and molasses that requires hours of cooking. Yikes! I didn’t think orange blossoms would be any easier to cook with (or find), but then I learned that the Orange Blossom is actually a cocktail. Not just any cocktail, but one that contains gin and vermouth (two ingredients we’ve got on hand thanks to our recent Dry Martini day), plus orange juice. Score! The exact history of the Orange Blossom is unknown, but it rose to prominence in the 1920s during Prohibition, when orange juice was used to cut the rancid flavor of illegal bathtub gin. A.S. Crockett’s Old Waldorf-Astoria Bar Book, published in 1935, contains two Orange Blossom recipes. Orange Blossom No. 1 is served neat and contains equal parts gin, vermouth, and OJ. It was allegedly invented by “some young bridegroom who wanted something novel to use at his final stag party.” Orange Blossom No. 2 is served in an old-fashioned glass with ice and omits the vermouth, calling for a 1:1 ratio of gin and orange juice. Since vermouth is sort of the Rodney Dangerfield of the alcohol world – it truly gets no respect – I’m not surprised that this second recipe doesn’t even bother with it. We figured, since we’ve got vermouth on hand, we might as well go ahead and use it, so we made a couple of Orange Blossom No. 1s. The result? Maybe not quite as bad as the dry martini…but it’s not something I would drink again. I’ve come to the conclusion that I’m not a fan of vermouth. Oh, yeah? We’ll consider that, then. We already have plans to continue the blog next year with new challenges. They just won’t be daily challenges. One of the ideas is to explore some of the food holidays we missed this year. Indian pudding could be a contender. I keep thinking of Johnny Cash and The Orange Blossom Special… comin’ down the railroad track….uh huh!! I’m not familiar with the Orange Blossom Special, but you can’t go wrong with some Johnny Cash! 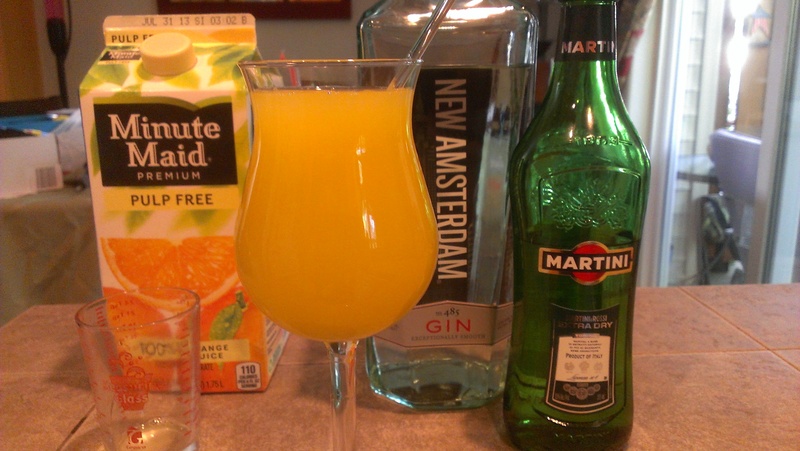 This brought back so horrible memories…..we used to make “screwed up screwdrivers” in high school. …..cheap vodka siphoned off our parents liquor shelf, TANG, and lemon juice. Bad juju right there. GAG. Hmm. I love a good Screwdriver, but I don’t think mixing Tang and lemon juice is a good substitute for OJ.